Jon Bones Jones got his nickname thanks to his long, skinny legs, but don't be fooled, this guy is strong. Here's a video of him doing some serious deadlifting. Edson Barboza's kicks are some of the most powerful in the UFC, and now we know where he gets all that power. Check out this intense leg workout routine designed by Edson's strength and conditioning coach Joe Mullings. This is an amazing workout. 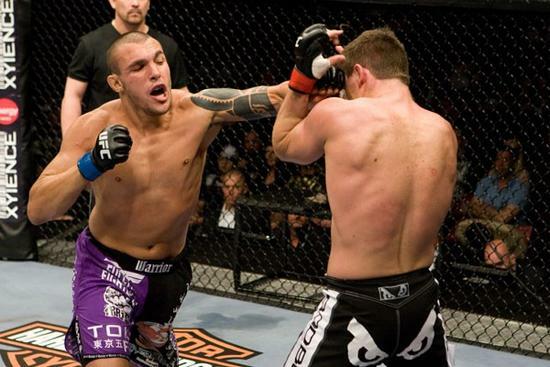 Vitor Belfort is one of MMA's best boxers, and his electrifying stand up has been thrilling MMA fans for years. In this video, he teaches you how to box for MMA. Obviously MMA boxing is different than boxing boxing, because mixed martial artists have to be concerned with other things besides their opponents' punches. Vitor shows you all the tricks. Luiz Cane is looking to reestablish himself in the UFC light heavyweight division when he takes on Stanislov Nedkov next week at UFC 134. Cane is coming off a win against Elliot Marshall and he wants to build off that win against Nedkov in Rio. If this training video is any indication, Nedkov is in for a tough night. This video comes courtesy of JiuJitsuMania.com. Check it, and them, out ASAP! Edson Barboza is a rising star in the UFC. His last fight won him Fight of the Night honors, and he's looking to keep the momentum going at UFC 134 in Rio next week. We've featured Edson a lot on here, and feel he's championship material in a very stacked lightweight division. Here's a video of the talented Brazilian fighter as he trains for Ross Pearson. This video is from JiuJitsuMania.com, an excellent website that you should definitely check out.